The Newfoundland and Labrador English School District represents all English speaking students and schools in Newfoundland and Labrador. The District is governed by 17 elected school board trustees and managed by a CEO/Director of Education, an Associate Director of Education (Programs & Operations) and two Assistant Directors: Human Resources; and Finance. 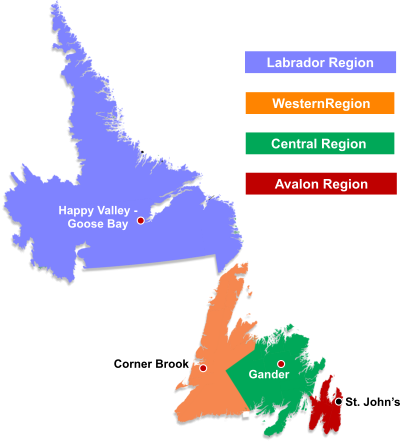 There are four regional offices in the province, located in: Happy Valley-Goose Bay; Corner Brook; Gander; and, St. John's. Each office has an Assistant Director of Education (Programs) and a variety of staff who support schools in areas such as programing, human resources, finance, facilities, and information technology. Senior Education Officers, program specialists, itinerant personnel, and support staff are located throughout the District and work with the administrators and school communities to ensure the goals of the strategic plan are met, and most importantly, students are provided the opportunity for academic and personal achievement. Below is a Google Map displaying all our regions, schools, and office locations province wide.